This holiday home sits right in the middle of some beautiful nature, surrounded by woods, meadows, tobacco fields and corn fields. A second holiday home is close by, but both have no direct view of each other, which means you have complete privacy. 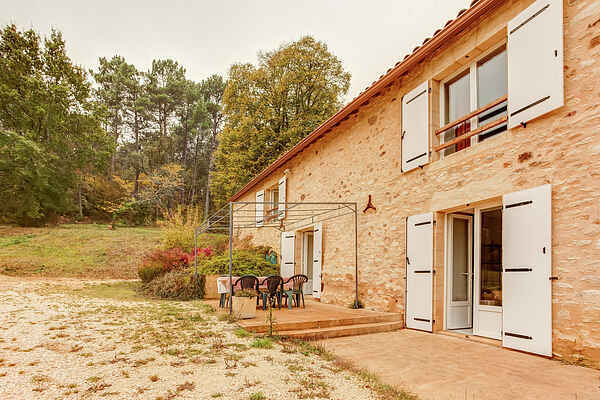 The house is a restored farmhouse with spectacular views and a light yet simple French interior. There is a well-equipped open kitchen, a spacious sitting room and several bedrooms and bathrooms. There's a large terrace outside from which you can enjoy the spectacular view over the fenced pool. Visit the markets of Prayssac and Libos, shuffle through the streets of Sarlat, a medieval city known for its historic centre and gastronomic delights. Villefranche du Perigord is close by so you can get groceries or relax on a terrace. In short, this area is made for everyone who loves good food and drinks and appreciates the culture. During the summer months there are pleasant markets and evening food markets everywhere. Take a seat at one of the long tables, enjoy culinary delights and the local culture. The Loubejac food market is well known and worth a visit! Go canoeing on the river Dordogne, cycling, horseback riding or simply stroll through this vastly varied landscape where there is something for everyone!